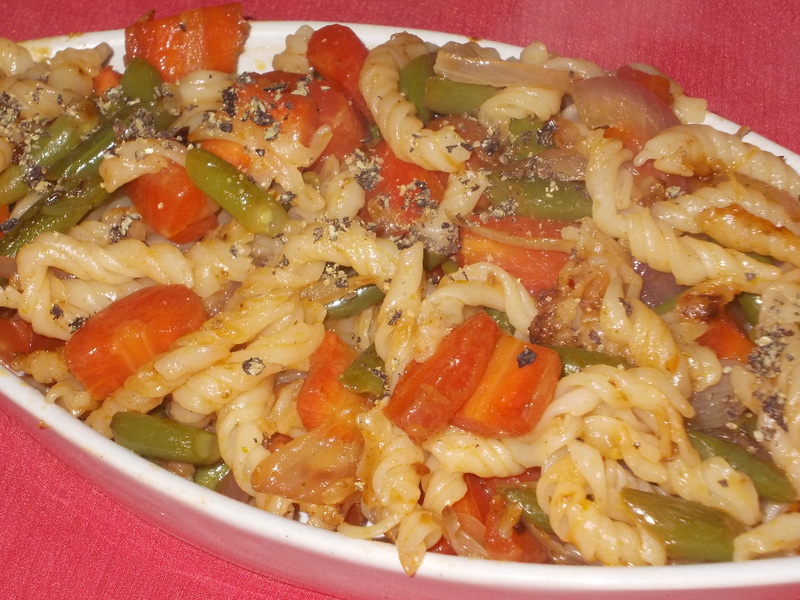 Chilli Garlic Pasta is a quick easy to make, delicious meal to enjoy in your party. Children like this very much. It will be a perfect meal for your child as it contains a good amount of vegetables which is very healthy. Boil pasta in 1 cup of water & ½ tsp of salt till pasta becomes soft. Drain out the water. Mix 1 tsp of oil with the pasta. Keep aside. Blanch carrot & beans in ½ cup of water & ½ tsp of salt. Drain out the water & keep aside. Add chopped onion, garlic green chillies & sautÃ© for 2 minutes. Add carrot, beans, chilli garlic sauce, tomato sauce, salt & toss well. Add pasta & spring onion (optional) & stir for 2 minutes. Remove fromheat, sprinkle pepper & serve.